When my son Andrew was four years old his pre-school teacher told me that he was having trouble understanding simple patterns. I was already concerned that he couldn’t always identify colors correctly. Were these signs of a learning disability, or was it something else? 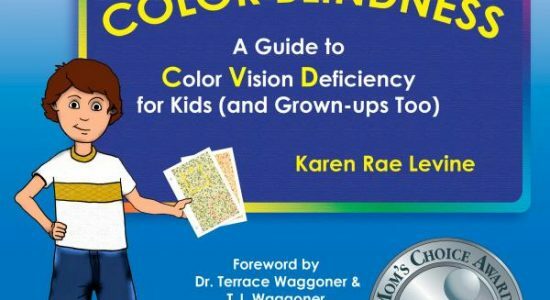 This is a guest article by Karen Levine, she is the author of the book All About Color Blindness: A Guide to Color Vision Deficiency for Kids (and Grown-ups Too). Our pediatrician didn’t have a color vision test, and referred me to an optometrist. The optometrist showed my four-year-old a book of pictures with shapes. These shapes would apparently not be visible to the colorblind. When they were finished, the doctor informed me that Andrew was red-green color deficient, or colorblind. were an integral part of the early education curriculum. I wanted to know if Andrew would be at a disadvantage when he started kindergarten. I wanted to know how he saw the world. I began to learn more about color blindness. Traveling through libraries, bookstores and the Internet, I tried to extract practical information from the maze of scientific books and articles. Very few publications were written in layman’s terms, addressing the day-to-day issues of the colorblind. I grew up with a colorblind father. My mother helped him match his clothes. He was restricted from choosing paint colors. And he occasionally needed some immediate assistance in determining the color of a traffic light. But those obstacles seemed to pale in comparison to the extremely color-oriented world that Andrew was going to face in kindergarten. Andrew can usually recognize a vibrant red or green but not lighter or duller hues. For instance, he can tell you the fire truck is red, but if you ask him to draw a picture of it, he could easily choose a brown crayon. Andrew made me a Valentine with a beautiful heart colored with forest green. He drew a pickle with a brown crayon. Sometimes those rosy faces he loves to draw are actually lime green. If you don’t know your child is colorblind, this kind of artwork can be puzzling. recognize that it had the potential to do some serious damage to his self-confidence. How many times already was he told he was wrong when he chose a color, or completed a pattern, or moved to a space on a game board? 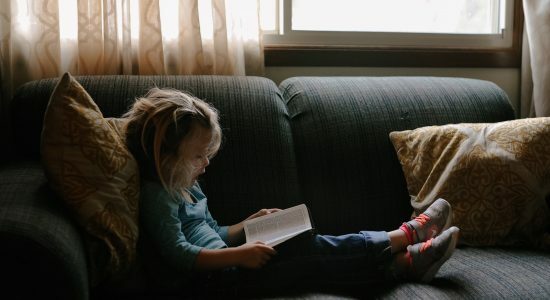 It might not seem catastrophic to an adult, but to a child these repeated situations can be disturbing. The solution was awareness. I told Andrew matter-of-factly that he had a special way of seeing colors. It wasn’t bad; it was just different. I told him that if he was ever confused about colors, he could just say so, and ask for help. I let Andrew know that there were many people who were colorblind, including his grandfather. When the family was together, we talked about it casually. Andrew’s older brother and sister asked him questions about it. Andrew was happy that they thought it was “really cool.” It was important that we kept the discussion light. Andrew was put at ease because we treated as an interesting circumstance, and not as an earth-shattering condition. When Andrew started kindergarten, I wrote a letter to his teacher to let her know that he was colorblind, and explained some of the ways that he could confuse colors. I didn’t expect her to get busy changing all the color-coded material in the classroom. I did at least want her to understand right away if Andrew told her he was confused. I followed up with a conference (without Andrew) and pointed out some of the areas in the classroom that might be a problem. She reacted very positively, and promised to keep an open mind when it came to Andrew and colors. About one out of twelve boys and one out of 200 girls are color blind. I thought, you’ve probably had one every year! Andrew’s teacher and I worked together. During a brief stop in the classroom, I noticed the pictures on November’s calendar were demonstrating a pattern… brown turkey, orange turkey, brown turkey, orange turkey. I offered to create new pictures for each day. I substituted a pilgrim’s hat for the orange turkey, creating a pattern that was easier for Andrew to identify: turkey, hat, turkey, hat. During the scheduled parent-teacher conference, I was very pleased with Andrew’s academic and social progress. I was also delighted to find out that Andrew spoke up on more than one occasion to ask for help with colors. Once, Andrew handed an assignment to the classroom aide, who told him it was the wrong color. He explained that he was colorblind, and shrugged off the mistake. Andrew asked the same aide to line up the crayons for him when he wanted to draw a rainbow. He was also overheard asking friends to help him with color choices. I felt that all that time and effort had paid off. I had a great kid with a terrific attitude. I’m sure there were times when he was confused or at a disadvantage because of color usage. If he couldn’t make out the cherries on George Washington’s cherry tree, he wouldn’t understand that it was because of his color vision. But Andrew seemed to be able to compensate. His selfconfidence was intact. I was just reaching around to pat myself on the back, when I realized that it wasn’t enough. What about all the other students in the school, or even in the district? I started writing stories that would help kids, parents and teachers understand colorblindness. I hired an illustrator and produced and published the book myself. All About Color Blindness: A Guide to CVD for Kids (and Grown-ups too) tells the story of Corey, a boy who struggles in Kindergarten because of his color vision deficiency. Along the way, Corey learns coping skills and keeps a positive attitude. So many years later, my amazing son Andrew is all grown up. He’s been hurdling color obstacles throughout his life and he always will be. But he’s developed a good set of coping skills. I asked him if he ever had trouble with Chemistry experiments and he implied it was a matter of course to depend on a lab partner. I asked him if he told his Chemistry teacher about his color vision and he said, “No.” He probably didn’t want to deal with the queries that would entail or pronounce himself “different” from everyone else. Even though so many of Andrew’s classmates share the same condition, I believe there’s still a stigma involved with colorblindness and this, of course, is due to a lack of awareness. As an adult, Andrew’s career choices will be limited, and it’s important that he knows it from the start. He probably can’t be a house painter, a geologist or a pilot. On the other hand, there is still a world of opportunity. Among the many professions I know the colorblind have had are: salesperson, engineer, computer programmer, journalist, principal, and teacher (including an art teacher!). One woman told me her father worked for a cosmetics company. Apparently, he could tell the shades of lipstick better than anyone. Have him or her evaluated by a professional. Before you make the appointment, make sure the office has a color vision test, and that it is appropriate for your child. If your child is not confident with numbers, there are tests that use shapes instead. Don’t let anyone tell you it doens’t matter. Make sure the teachers know. Start with a letter to the classroom teacher, explaining your child’s problem colors. Then follow up with a conference. Don’t forget to make contact with the art, music and gym teachers, and perhaps a reading teacher or occupational therapist if you use one. Remember, approaching a teacher as a partner is more effective than making demands. Look around the classroom and give examples. Offer to help. Communicate with your child honestly and matter-of-factly. Keep a sense of humor. It’s not the end of the world. It’s just a different view of it. Being color blind as a child can be challenging. There are several books about color blindness for kids available. This book for kids (and grown-ups too) follows Corey on a journey that begins with problems caused by his color confusion. 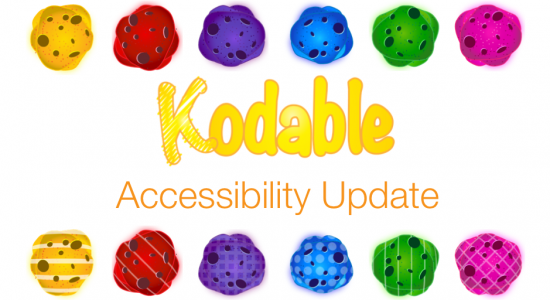 Kodable now features a Colorblind Mode that can be enabled or disabled at any time by their 15 million users.